Michael Bloomberg (b.1942) is a billionaire philanthropist (net worth est. 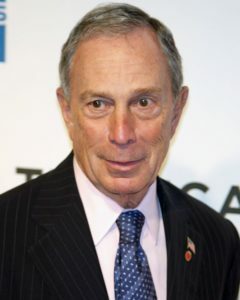 at $48b in 2017—10th richest in the world), founder of Bloomberg L.P. (financial services, mass media, and software) and Bloomberg Philanthropies, and former Mayor of New York City (2002-2013). In April 2007, he launched PlaNYC (now OneNYC) to combat climate change and improve quality of life. He also launched the Million Trees NYC initiative in 2007 and the NYC Panel on Climate Change in 2010. Bloomberg served as Chair of C40 (2010-2013) a network of megacities tackling climate change, and as president of the C40 Board. He helped to launch the Compact of Mayors (2014) and the Climate Summit for Local Leaders (2015), and sponsors Bloomberg New Energy Finance on the new energy economy. Through Bloomberg Philanthropies, he donated $164m since 2010 to the Sierra Club’s Beyond Coal campaign to shut two-thirds of US coal-fired power plants by 2020, and another $50m to expand the program into Europe and then the rest of the world. In 2014, he gave $53m to the Vibrant Oceans Initiative to reform fisheries management, and has also given $6m to the Environmental Defense Fund for strict regulation of fracking. He launched the Risky Business initiative in 2013 with Hank Paulson and Tom Steyer, reporting on economic risks of unabated climate change, and published a nonfiction bestseller Climate of Hope: How Cities, Business, and Citizens Can Save the Planet (April 2017) with co-author Carl Pope, former Executive Director of the Sierra Club. In March 2018, Bloomberg was named the UN Special Envoy for Climate Action.